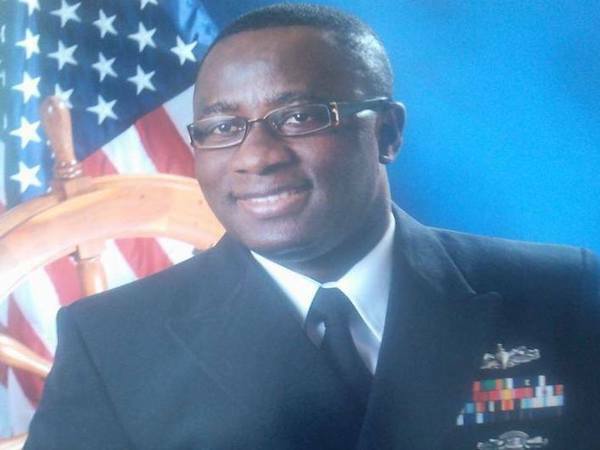 Nigerian born Lt. Victor Agunbiade has been named among the top 18 US Navy recruiters of 2017. 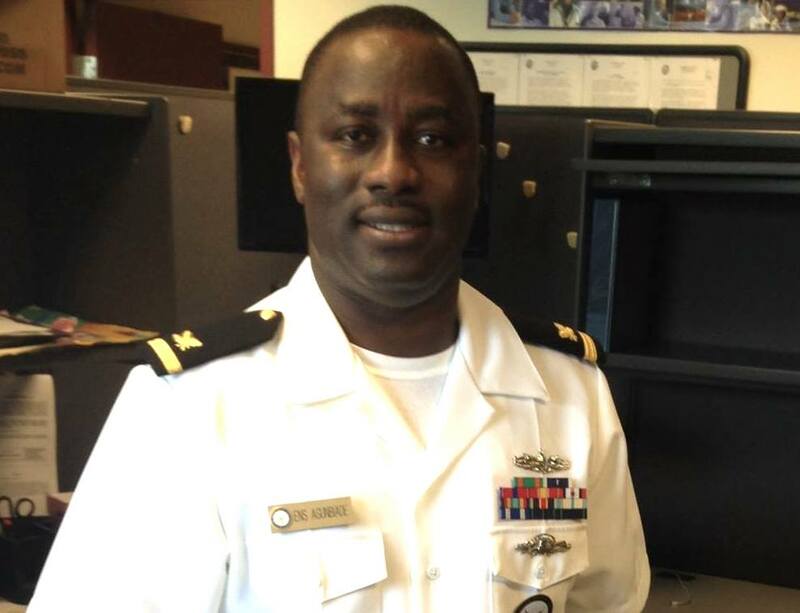 Agunbiade was named the Officer Recruiter of the Year, and honored along with 17 others during the annual Navy Recruiting Command’s Recruiter of the Year ceremony in Washington D.C. on May 17th. 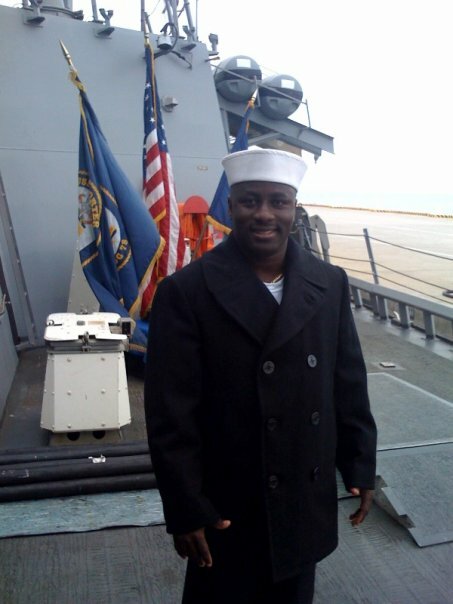 Agunbiade started his career in the Navy in 2008 as a logistics specialist before becoming a supply corps officer. 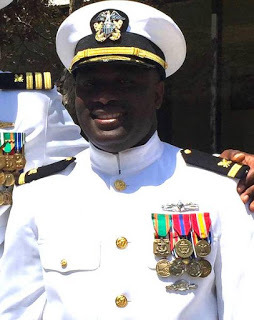 In November 2015, he became a recruiting officer, and he is active till date. 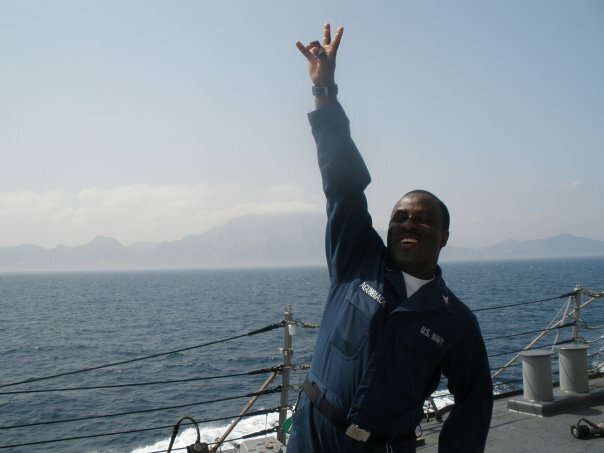 This award spotlights the sailors for their talent acquisition expertise and positive impact in their local communities. “We are here tonight to recognize the superb work of these outstanding Sailors,” said Peter Garvin, commander, Navy Recruiting Command. 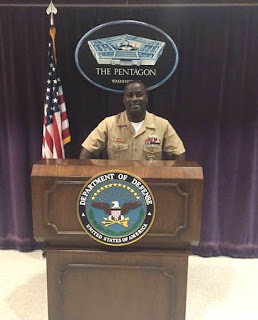 The 18 awardees had the opportunity to visit the Pentagon and meet with senior Navy leadership including Robert Woods, assistant secretary of the Navy for manpower and reserve affairs, and Patrick Barrett, deputy chief Navy Reserve. Operations Specialist 1st Class Ryan Clark, Enlisted Recruiter of the Year, Active; Lt. j.g. Massimo Ongaro, Officer Recruiter of the Year, Navy Reserve; Navy Counselor 2nd Class Jason Ellis, Sourcer of the Year; Navy Counselor 1st Class James Condon, Sales of the Year; Aviation Structural Mechanic 1st Class John Redshaw, Assessor of the Year; Machinist’s Mate 2nd Class Louis Smith, Onboarder of the Year; Machinist’s Mate (Nuclear) 1st Class Luis Saucedo, Nuclear Field Coordinator of the Year; Machinist’s Mate 1st Class Suemaya Dib, Station Leading Petty Officer of the Year; Navy Counselor Chief Petty Officer William Currie IV, Division Leading Chief Petty Officer of the Year; Ship’s Serviceman 1st Class Fritzi Castillo-Trinidad, Diversity Enlisted Recruiter of the Year; Lt. Derek Strauser, Diversity Officer of the Year; Navy Counselor 1st Class Matthew Weldy, Medical Officer Recruiter of the Year; Lt. Jeffery Shepard, Nuclear Propulsion Officer Candidate Recruiter of the Year; Utilitiesman 1st Class Kevin Yaksich, Navy Special Warfare/ Navy Special Operations Recruiter of the Year; Personnel Specialist 1st Class Paul Lagman, Classifier of the Year and Yeoman 1st Class Roy Stanley II, Support Person of the Year. Hi everyone, I was going crazy when my husband breakup with me and left me for another woman!! All thanks to LORD JUMA the best love spell caster online that helped me to bring back my husband today and restore happiness in my marriage.. I'm DIANA DIVEN by name i lives in England. My husband breakup with me and left me to be with another woman, and i wanted him back. I was so frustrated and i could not know what next to do again, I love my husband so much but he was cheating on me with another woman and this makes him break up with me so that he can be able to get married to the other lady and this lady i think use witchcraft on my husband to make him hate me and my kids and this was so critical and uncalled-for, I cry all day and night for God to send me a helper to get back my husband!! I was really upset and i needed help, so i searched for help online and I came across a website that suggested that LORD JUMA can help get ex back fast. So, I felt I should give him a try. I contacted him and he told me what to do and i did it then he did a spell for me. 28 hours later, my husband really called me and told me that he miss me so much, Oh My God! i was so happy, and today i am happy with my man again and we are joyfully living together as one big family and i thank the powerful spell caster LORD JUMA, he is so powerful and i decided to share my story on the internet that LORD JUMA is best spell caster online who i will always pray to live long to help his children in the time of trouble, if you are here and your lover is turning you down, or your husband moved to another woman, do not cry anymore, contact this powerful spell caster LORD JUMA on his email at: mercyfullsolutionhome@yahoo.com or mercyfullsolutionhome@gmail.com you can visit his Website Via> http://mercyfullsolutionhome.website2.me or his blog> https://mercyfullsolutionhome.blogspot.com add him up on whatsApp @ +1 (859)-203-2241 . My husband was flirting with another woman. until he vanished away, I was desperate to get him back, I wasted so much time and money trying to get my Husband back, I tried almost all possibilities to have him back and nothing worked. I became lonely. To make it short, I found a spell caster Dr Sam. 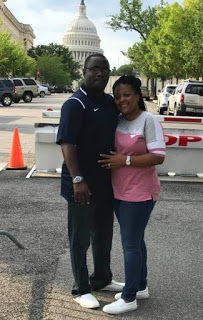 I saw the good testimonies about his wonderful work and after reading the Testimonials, I decided I had to try and give it one last try and After the spells, a miracle happened, my husband came home. It was awesome, anyone who needs help, should email him (Supremespellcast@gmail.com Or Supremespellcast@yahoo.com) Or whatsApp him on these number. +2347087462033..
My name is TYLER VICTORIA, I am overjoyed because my prayers have finally been answered,i have always wished to have my ex husband back,because i wanted my family to be happy again, until i met DR PETER who solved my problems for me, and i am sharing this testimony because i believe they are people out there who need solutions to problems like this. When my ex husband left me I was very much devastated and i always wanted back and it got to a period I no longer wanted him back again. After 7 years, my first son was 12 years old, he came home from school and said he was missing his father and all the love he showed when he was around him. The feeling rushed through me like an emotional straining and I had a huge urge to have him back. What happened to us that we separated was what i couldn't think of what started the fight. I contacted DR PETER online after reading about him of how he has been helping other people with their problems and i contacted his email at magnificentspellcast@gmail.com and i was able to speak with him. I am happy and very overjoyed that after 7 years, all i wanted was to be reunited with my family and make my life whole again. Thank God for this great and real spell caster DR PETER. and i want everyone who have same problem as i had to contact this great man at magnificentspellcast@gmail.com or you can add him up on his whatsapp via 08125435799 and share your testimony with the world. Am writing this article to thank Dr. Sam for the wondrous miracle that he did for me because he helped me recently to bring back my Ex husband. Thank you, sir, for your genuine spells. This is really incredible, I have never experienced anything like this in my life. Before I met you, Sir, I have tried every probable means that i could to get my husband back, but I actually came to realize that nothing was working out for me and that my husband had developed a lot of hatred for me.. I thought there was no hope to reunite with my husband. But when I read good reviews about how Dr. Sam help others get back there ex-lovers, make others to win big on lottery, cure of any sickness. I decided to give it a try and I did everything that he instructed me and I Trusted him and followed his instructions just as he guaranteed me in 48 hours, and that was exactly when my husband called me and come back to me.. I'm so happy for the good work you did for me. We are more contented now than ever. Everything looks perfect and so natural! Thank you so much Sir for your authentic and indisputable spells. Am writing this article to thank Dr. Sam for the wondrous miracle that he did for me because he helped me recently to bring back my Ex husband. Thank you sir for your genuine spells. This is really incredible, I have never experienced anything like this in my life. Before i met you Sir, i have tried every probable means that i could to get my husband back, but i actually came to realize that nothing was working out for me, and that my husband had developed lot of hatred for me.. I thought there was no hope to reunite with my husband. But when i read good reviews about how Dr. Sam help others get back there ex lovers, make others to win big on lottery, cure of any sickness. I decided to give it a try and i did everything that he instructed me and i Trusted him and followed his instructions just as he guaranteed me in 48 hours, and that was exactly when my husband called me and come back to me.. I'm so happy for the good work you did for me. We are more contented now than ever. Everything looks perfect and so natural! Thank you so much Sir for your authentic and indisputable spells. Hi everyone, I was going crazy when my husband breakup with me and left me for another woman!! All thanks to LORD JUMA the best love spell caster online that helped me to bring back my husband today and restore happiness in my marriage.. I'm DIANA DIVEN by name i lives in England. My husband breakup with me and left me to be with another woman, and i wanted him back. I was so frustrated and i could not know what next to do again, I love my husband so much but he was cheating on me with another woman and this makes him break up with me so that he can be able to get married to the other lady and this lady i think use witchcraft on my husband to make him hate me and my kids and this was so critical and uncalled-for, I cry all day and night for God to send me a helper to get back my husband!! I was really upset and i needed help, so i searched for help online and I came across a website that suggested that LORD JUMA can help get ex back fast. So, I felt I should give him a try. I contacted him and he told me what to do and i did it then he did a spell for me. 28 hours later, my husband really called me and told me that he miss me so much, Oh My God! i was so happy, and today i am happy with my man again and we are joyfully living together as one big family and i thank the powerful spell caster LORD JUMA, he is so powerful and i decided to share my story on the internet that LORD JUMA is best spell caster online who i will always pray to live long to help his children in the time of trouble, if you are here and your lover is turning you down, or your husband moved to another woman, do not cry anymore, contact this powerful spell caster LORD JUMA on his email at: mercyfullsolutionhome@yahoo.com or mercyfullsolutionhome@gmail.com you can visit his Website Via> http://mercyfullsolutionhome.website2.me/ or his blog> https://mercyfullsolutionhome.blogspot.com add him up on whatsApp @ +1 (859)-203-2241 . MAGNIFICENTSPELLCAST@YAHOO.COM or You can call/whatsapp him +2348125435799. website http://MAGNIFICENTSPELLCAST.website2.me and get you problems solved 100% assured. Hello everyone i know there is someone somewhere reading this,My name is lisa donna from USA,I want to share a great work of a spell caster called PRIEST WISDOM my husband and i had a fight which led to our divorce but when he left me a part of me left with him and i was to sad and cried all day and night i was searching something online when i saw people testifying about his great work and i just decided to give him a try i did everything he told me to do and he assured me that after 24 hours my husband will come back to me,the next morning to my greatest surprised a car stopped outside my house and it was my husband i'm so happy he can also help you email him at supernaturalspell@yahoo.com or whatsapp him +2348124644470 … OR VIEW THIS https://lettalaabourtrelationship.blogspot.com…. I’m from united kingdom…I just found out about my husband cheating on me with a co-worker! We’ve been married going on two years. 2kids. lots of amazing moments together. i want to leave, but i love him so much. all i can think about is how nothing stopped him. how he has to see her everyday because they work together. we are both still young and very attractive. but i want my husband, my friend, and the father of my beautiful children. how do i get past the thought of another woman having my husband? 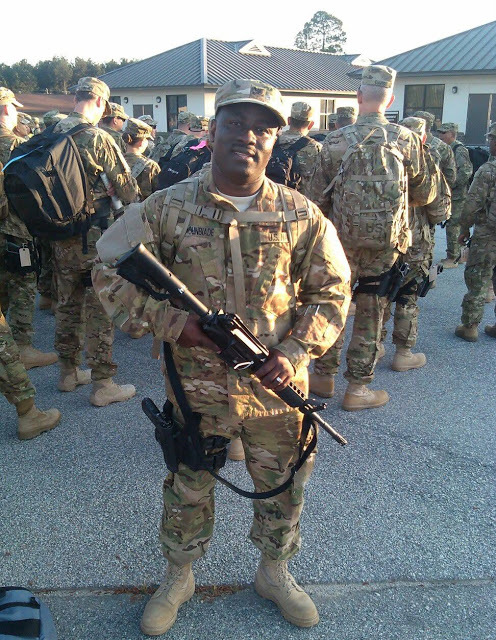 Not my fiance, not my boyfriend, but my husband! i still love him even though he thinks i want to leave i really want him to do better and stop me before i walk out! my husband told me that he doesn’t feel loved anymore, just because of this co-worker he has be cheating on with me that he wants a divorce, i was devastated, heart broken i begged him to listen to me that we can work it out like we always do, but he didn’t listen, he told me that he met someone that loves and understands him, i begged him to consider our kids but he’s did listen. he left and i was frustrated, i began searching for help and answers, then i heard about a man that can Cast a spell to remind him of all the things we have been through together, at first I was scared then i decided to give it a try, and like magic my husband came back, apology and begging for forgiveness, thanks to this man, I’m posting this to help people with similar issues. You can contact him on via drabakaspelltemple@gmail.com or whats app +2349063230051 for help too.